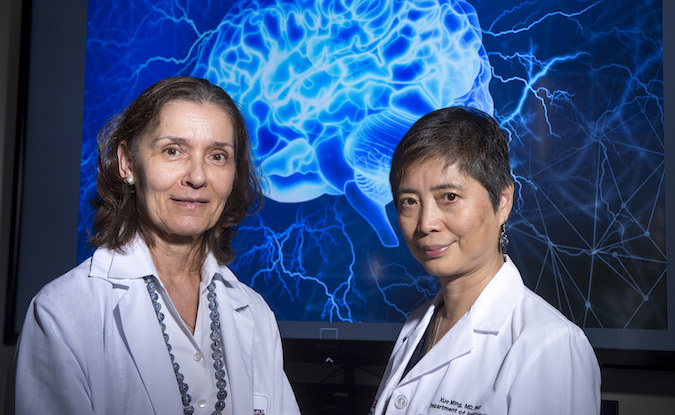 The study was led by Martha A. Mulvey (left), ANP, with co-author Xue Ming, MD, PhD. A tool to screen for sleep apnea in patients with epilepsy can improve their quality of life, according to a recent study. Researchers from Rutgers University aimed to develop, implement, and evaluate effective strategies to examine electronic health records in screening for obstructive sleep apnea (OSA) in patients with epilepsy. In the past, studies have shown that patients with epilepsy have a higher prevalence of obstructive sleep apnea—the Epilepsy Foundation estimates as many as 40% of patients with epilepsy have OSA—which can contribute to more frequent seizures, the study authors wrote. They added that with the detection and treatment of sleep apnea, which is often underdiagnosed in these patients, can improve seizure control in epilepsy patients. The researchers conducted a three-month retrospective study of the electronic health records of all epilepsy patients aged 18 years or older. They were evaluated in the researchers’ epilepsy clinics before the start of the intervention. Using 12 recognized risk factors for sleep apnea, the researchers developed a screening tool and embedded it into the electronic health records. The risk factors include high body mass index, snoring, choking or gasping in sleep, unexplained nighttime awakenings, morning headaches, dry mouth, sore throat or chest on wake up, undue nighttime urination, decreased memory and concentration, neck circumference greater than 17 inches, excessive daytime sleepiness, undersized or backward displacement of the jaw, and the distance measured between the tongue base to the roof of the mouth. If a patient was screened for 2 or more risk factors, they were referred for polysomnography. Then, the researchers compared the difference between the number of patients at risk for sleep apnea detected and referred for polysomnography with and without the electronic health record screening tool. The tool significantly increased recognition of patients with sleep apnea, the researchers reported. For example, before the implementation of the tool, 7.23% of patients with epilepsy were referred for polysomnography—just 25 of 346 patients. After the screening tool was put into place, 405 of 414 patients’ electronic health records were screened and a third were referred for polysomnography, or 134 patients. The study authors said their screening tool “demonstrated markedly improved identification” for sleep apnea in epilepsy patients and referral for polysomnography. The paper, “Electronic health record cue identifies epilepsy patients at risk for obstructive sleep apnea,” was published in Neurology Clinical Practice.